I have received a series of transmissions which brought forward this information. The first pulse came in 2003-2004, Spectral Wizard Year. I share this with the community who can understand and embody its hidden agenda..and make use of the sacred sequence and meditation which it teaches..
Click the image above to download a high resolution image of the 19:19 Crystal Matrix. 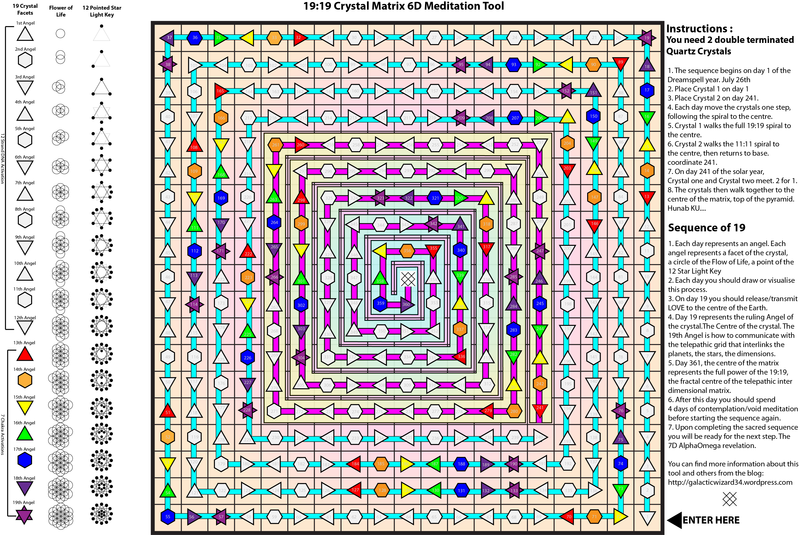 The 19:19 Crystal Matrix is a 6th Dimensional matrix. It contains and delivers prophecy, time and magic to the sub dimensional systems. In the matrix you use 2 double terminated quartz crystals, these crystals represent your 5d Archetypal Self and your TeleCosmicTwin, your 6th Dimension self manifested in twin form in the 5th Dimension. 5th Dimensional Archetypes are the spirit of myth, they are the bearers of prophecy, the glue which forge human belief systems in place. By using the matrix, you begin to intricately understand your purpose within the prophecy and activate and uncover your true self, mapping your true self to the 6th Dimension. The 19:19 Crystal Matrix is built upon the sacred sequence of 19. You can see the power of 19 in the sacred meditations of the Flower of Life.. The Celtic Great year is 19 years in length, and syncs the full moon to the same day of the solar year. The power of 19 also lives within the double terminated quartz crystal (6+6+6+1). By using this sacred sequence you gain access to the silicon matrix, within which you can tweet interplanetary and galactic communication, the language of the stars.You can communicate to your self, your true self which exists in multiple dimensions. This information was delivered to me through my use and understanding of the sacred quartz crystal. In the 3rd dimension, the sequence represents light entering the crystal, refracting inside then forming a rainbow as the light exits. In the 4th dimension, Time enters the crystal, is refracted between the angels, and exits as a rainbow of timelessness. By understanding this process you submit your 3D self into harmony with your TRUE self, your cellular memory, your archetypal purpose, and the divine integration of masculine and feminine energies. The 19.19 matrix fits perfectly into the solar year. 19×19=361 days. There are 4 days of contemplation and void mediation at the beginning/end of each cycle (July 22-25). The sequence begins on July 26th, Day 1 of the Dreamspell 13 Moon Solar Year. So each 19.19 solar year mediation, embodies and integrates with the Dreamspell count. In fact, the 19:19 Matrix is a perfect container of 4D time, the Dreamspell. Each year (cycle) you activate a double terminated crystal (19), of double terminated crystals (19). You activate a Flower of Life (19), of Flower of Lives (19 circles). It is a multidimensional fractal light key of consciousness and “multi-dimensional self” remembrance. By following the daily count and meditation you being to re-member all the pieces of your self that have been scattered between the dimensions, forming an axis of self and that illuminates and integrates your TRUE self into a glowing awoken soul. Walks the 19:19 spiral to the top of the pyramid, centre of the Matrix, Hunab Ku / Votan’s Stone. The first crystal represents your 5D self on your quest, on your sacred walk through space, time and prophecy. In search of your true self and the inevitable mastery of the 6D matrix. This crystal begins on matrix coordinate 1, and walks the full 19.19 spiral to the centre, or top of the pyramid. Walks the 11:11 Spiral to the top of the pyramid, centre of the Matrix, Hunab Ku.. The Tele-Cosmic-Twin is your 6D self manifested in the 5th dimension, embodied in a myth of your making. Your Tele-Cosmic-Twin may manifest to lower dimensions also.Understanding this is paramount to understanding the sequence. Being in communion with your twin is when the real magic begins to manifest. You are your own prophecy, you create your own myths. This is the 6th Dimensional invocation. To awaken your 5D self within the 4D of time. Just as time (4th Dimension) breaths movement into the static 3rd Dimension. the 5th Dimension breaths myth into the 4th Dimension. You can clearly see this when you study the 19:19 Matrix. The Dreamspell Solar Year is perfectly contained within the matrix. Day one of course being the Solar Year Kin, in this years case (Resonant Storm Year), Resonant Storm kin 59. Taking this concept further, you can see that day 241, when the two crystal (5D) archetypes meet, is also a Storm kin, this year being Cosmic Storm, kin 39. Confirming this further, the final day of the matrix, and centre point (top of the pyramid) is Electric Storm, kin 159. I understand it therefore that the 19:19 Matrix, is a container for the 4th Dimension of Time, the Dreamspell. You can begin to understand that the 5D archetypes, if represented by Pakal Votan and the Bolon Ik, are the shepherds of time and myth as it manifests in the 4th Dimension. When the sequence begins on July 26th, day one of the dreamspell. The tele cosmic twin sits on matrix coordinate 241. The tele cosmic twin walks the 11:11 spiral Matrix, to the centre (the Hunab Ku), then back to coordinate 241. At which point on Day 241 of the sequence. The the archetypal self meets with the TeleCosmicTwin and they begin the walk together to the centre of the matrix, or top of the pyramid. All you have to do is place crystal one on day 1, and each day move the crystal one step following the 19:19 path to the centre of the matrix (top of the pyramid). The second crystal (tele cosmic twin) starts on coordinate 241, and each day moves one step along the 11.11 matrix.. When the tele cosmic twin reaches the centre (top), it turns back and returns to base (241). When the telecosmic twin reaches coordinate 241, it will meet the true self, and they will walk to the centre, or the top of the pyramid and ascend….Simple as that. You have found your twin self, you are at one with your 6D true self. You are moving towards ascension to 7D consciousness which is the next step.. This is just a basic understanding of the system and it will be elaborated on in future posts. If you have landed directly to this page and would like to continue reading. I recommend to read The Prophecy of The Pyramid and The Cube . excelente trabajo, un gran aporte a la Ley del Tiempo. ¿Como integras esta matriz a la Matriz 21×21, matriz 441? Quantum tribes in sync with 19 circles in flower of life mystical. Thank you kin 34. What is your Mayan kin?